Our hunt for a striker is no secret, but there could be one available closer to home than we thought. 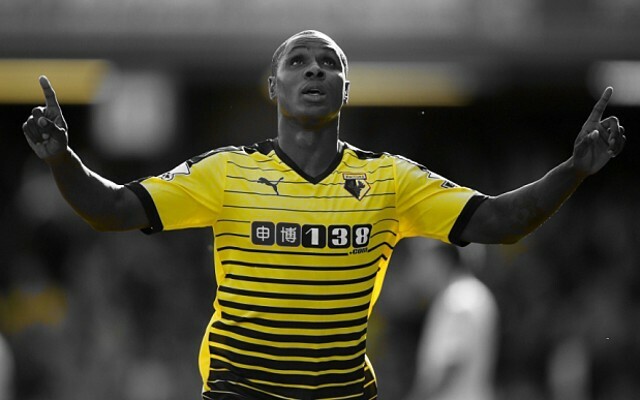 Our neighbours in the north-west Watford are apparently looking to cash in on Odion Ighalo, and Arsenal, Chelsea, and Manchester United have all been alerted to his potential availability this summer, as reported by the Mirror. Ighalo has been one of the in-form strikers in the Premier League this season, with only Jamie Vardy, Harry Kane, Romelu Lukaku, and ahead of him. The fact that he’s plying his trade with Watford makes it all the more impressive, as the Nigerian doesn’t have world class playmakers behind him. The Mirror’s report suggests Watford have already identified Ighalo’s replacement, and are confident of tying up a move for Spanish striker Isaac Success. As soon as that move is done they’ll be willing to listen to offers for Ighalo, and it doesn’t look like he’ll be leaving the Premier League. Arsenal, Chelsea, and Manchester United are all in need of a striker, with all three sides fairly limited in their options. Chelsea seem to have very little faith in Loic Remy, and with Alexandre Pato only there on loan, they are still thought to be on the lookout. Manchester United only really have Wayne Rooney and Anthony Martial, and Louis van Gaal seems determined to play both players anywhere but up front. We’ve got Olivier Giroud, Danny Welbeck, and Theo Walcott to call upon, but apart from the Frenchman we really haven’t been able to rely on our striking options. Ighalo has been excellent this season, but he’s arguably not what we need, and may not be ready for a step up to a club the size of Arsenal. For all we know he’s a bit of a one season wonder, and he really doesn’t seem like he’d be an upgrade on what we’ve already got. If we’re going to bring a striker in it should really be a world class forward capable of replacing Giroud.